Selena Sermeño is a psychologist, social science educator, organizational consultant, expert witness, and dialogue facilitator. A native of El Salvador, she came to the United States at the onset of the country’s 12-year civil war. 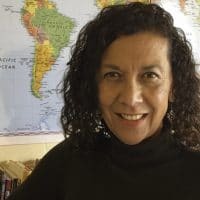 Selena’s doctoral research focused on the impact of political and social violence on Salvadoran adolescents, cataloguing the suffering and post-traumatic ramifications of youths’ exposure to extreme adversity. This study has shaped Selena’s career, highlighting the importance of adopting a human dignity, human rights, and intergenerational frame in the practice of psychology. Selena’s areas of expertise include youth mental health, trauma-sensitive practices, cross-cultural dialogue, social and emotional learning approaches to education, juvenile justice, and intergenerational collaboration. She has worked with organizations worldwide, focusing on children, youth, and families in the most vulnerable of human conditions. Such traumatic circumstances include domestic and gang violence, incarceration, civil war, cultural displacement, global migration, and natural disasters. For the past 17 years, Selena has mentored adolescents from over 80 countries through her involvement with the United World College (UWC)-USA and UWC-Costa Rica. Her involvement with these institutions has focused on program development in the areas of dialogue, constructive engagement of conflict, emotional wellness and youth leadership. Additionally, Selena serves as a consulting psychologist for projects empowering youth and women to overcome the impact of historical trauma and cultural dislocation in places such as the Navajo Nation, El Salvador, and isolated mountain communities in the US. Selena considers herself a global citizen and believes wholeheartedly in the power of intergenerational and cross-cultural friendships to create sustainable social change. Her work has spanned the US, Central America, Asia, Africa, and the Middle East. Selena’s work has been published by PBS’ Need to Know, Anchor Magazine, The Huffington Post and The International Encyclopedia for the Study of Conflict Studies and Peace Building. She resides in Durango, CO. Selena’s passions include traveling, reading, hiking, photography, watching documentary films, and hanging out with friends.